Try restaurants down by the beach. Lovely restaurant straight down the road called katelios grill house we had our evening meal there all week they were very friendly and helpful and they gave us a free bottle of wine the food was excellent and not expensive . If you want a quiet relaxing holiday it's just the place. KATELIOS IS A VERY QUIET RESORT WITH QUITE A RUSTIC FEEL. LITTLE TO DO FOR TEENAGERS IN THE WAY OF DISCOS BUT OURS HAD A GREAT TIME EATING AND DRINKING WITH US AT THE SEVERAL TAVERNAS ALONG THE BEACH AND ACTUALLY APPRECIATED THE LAID BACK ATMOSPHERE. OCCASIONAL DALIANCES WITH THE 2 OR 3 MUSIC BARS BUT MOSTLY CONTENT TO END THE EVENING BACK AT EFROSINI BAR ALONG WITH OTHER GUESTS. 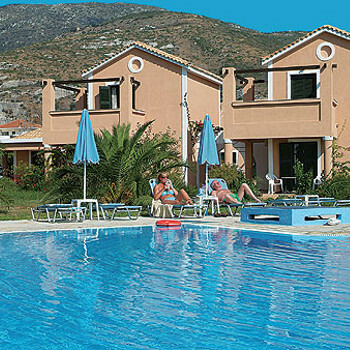 IF YOU WNT A HOLIDAY AWAY FROM ALL THE MADNESS WHERE YOU CAN JUST CHILL OUT THEN KATELIOS IS FOR YOU. as we stayed in may sometimes the beach had a lot of weed washed up .but it was being cleaned up as weather improved.tavernas about twenty all very welcoming food generaly very good .most did chips with every thing but if you requested more greek found them to be exellent.free sun beds infront of tavernas .5 euros on the other beach lovely for swimming in also dreams snack bar exellent .definately would visit again beautiful surroundings mountains sea lovely flowers .hire a car its fun to get out and about stunning views from the mountain roads . Katelios is a nice quiet friendly village with a row of tavernas on the waterfront. There are a few shops which all stay open late plus car hire offices etc. Nearest ATM is in Skala, 7km away. Beach did not look as nice as some others we saw but there are loungers and umbrellas for hire. over the headland at the far end of the beach ( follow the blue plastic ribbons ) after about 15 mins you come to Mounda beach keep walking a little futher and it turns into a wide strip of sand and shallow clear water- just what we were expecting in Katelios! The resort is very quiet and relaxing but not representative of most of Kefalonia- so you might want to hire a car and explore the rest of this beautiful island , Assos and Myrtos are definately worth a visit. Katellios was closing down during our stay every day there would be one less Taverna to eat in or another bar shut down. The village has a sea front lane lined with Tavernas and fish restaurants and little else, the beach is a bit gravely and recent storms had washed piles of seaweed along the shore line. Having said all those negatives the village had a certain charm, local women sweeping the dusty street with Olive branches, fishermen bringing in their daily catch, the door to door chicken salesman, the atmosphere was so laid back and carefree it was kind of perfect. We used Captain Kostis water taxi to get to the next main resort of Skala- This trip was an experience in itself quite a thrill ride without too much attention to H&S!, dismounting the boat via a pair of household step ladders! Skala was bigger with more open, shamefully an English breakfast was enjoyed at Scandanavia restaurant, there were a couple of trendy looking music bars and we found an excellent Giros restaurant (but can't remember the name!). We hired a car from Greekstones Car Hire who provided an excellent service and quality car delivering and collecting the car from our apartment, so spent 3 days travelling round this beautiful Greek Island -I recommend doing this as other than the beach there is not a lot to do in Katellios! having said that two tavernas stood out for us Albouro Restaurant on the beach and slightly away from the village centre served good food and ice cold Mythos, and on the opposite end of the village Cozy Restaurant- was just that! Unfortunately the building of a new harbour and 90 bed all inclusive hotel could soon spoil this peaceful village. A small town with good taverna's and fortunately very little in the way of noisy nightlife. The people are very friendly. There is a very limited bus service. The sea is just perfect, a gently sloping shore line ideal for youngsters. Katelios really is a sweet place where the people welcome you with open arms (not hands). the standard of food in the tavernas and restaurants is high with good variety and there is the odd bar where you can just sit and take a drink. There are a few tavernas in the village itself including Deans Cafe Bar where you can get full English if that floats your boat. There are two or three supermarkets and a bakery although no bank.ATM,doctor or pharmacy. At the time of writing the nearest pharmacy was in Poros (the one in Scala was shut). there is money exchange at the car hire offices which do bank rate minus 2%. the beach is nothing to write home about but certainly nothing to get too upset about either. They are building a new marina to the west of the sea front but this did not interfere with the holiday.Local transport is very limited, check timetables locally as they do change.there are card phones and pay phones in the village. English is very widly spoken but as in any other place in Greece a few words of Greek are welcome and greeted enthusiastically. Sad to say goodby but it was getting too hot for me.We were told that in the main season it's overrun with Italians. For car rental see Kostas at Venus he's excellent. The resort is quiet but everyone is very friendly and you'll just enjoy a nice relaxing time.The restaurants are very good serving excellent local food. Thank goodness there's not a McDonalds in sight! The two bars are very good to enjoy a drink or two before eating.